I'm calculating my data with JASP. But, when I compare mean values calculated by clicking descriptives and using rmANOVA-> Descriptives, I found that those values are not same. 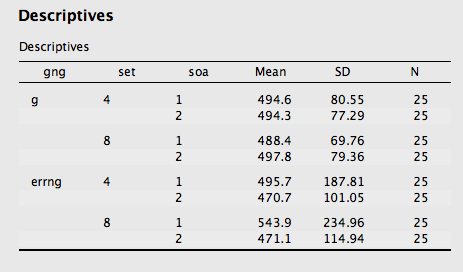 Descriptive values are identical with values calculated by Excel 'Average' function. Can anybody explain this ? This appears to be the case because of N. In the ANOVA case, you see that N=25 everywhere. For "descriptives", some N's are 27. So I assume that there are two subjects you have missing values for some of the conditions, which means that they are excluded from the analysis.